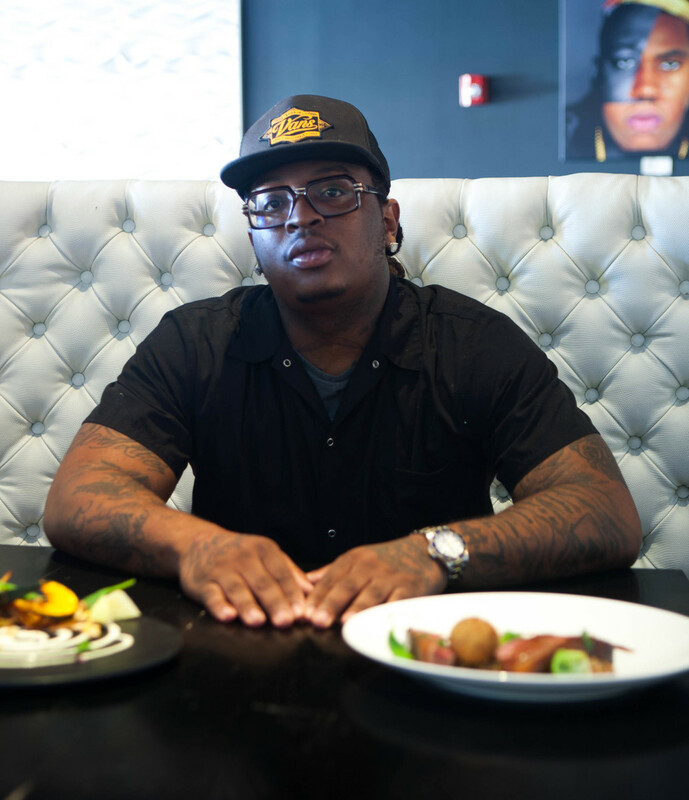 Hanging with 28-year-old Chef Akins Amoroso at Milk River restaurant in Brooklyn, NY, with the collage of Biggie, Jay Z and Nas hovering over his head in the background, it felt more like an exploration into hip hop culture as opposed to food. Looking past his Vans cap, Run DMC inspired eyewear, and tatted skin we heard those familiar notes of passion as he shared his culinary aspirations, inspirations and a love affair with food. The tattoos on his right hand say it all: a nod to a Michelin recommendation 3 years in a row achieved for his skills at one of his restaurant bases, Elberta, and of course "live to cook" his every day mantra. What makes him stand out is probably what will propel him forward in an ever evolving culinary industry where mashups between cultures and experiences continue to influence food and drive trends all over. 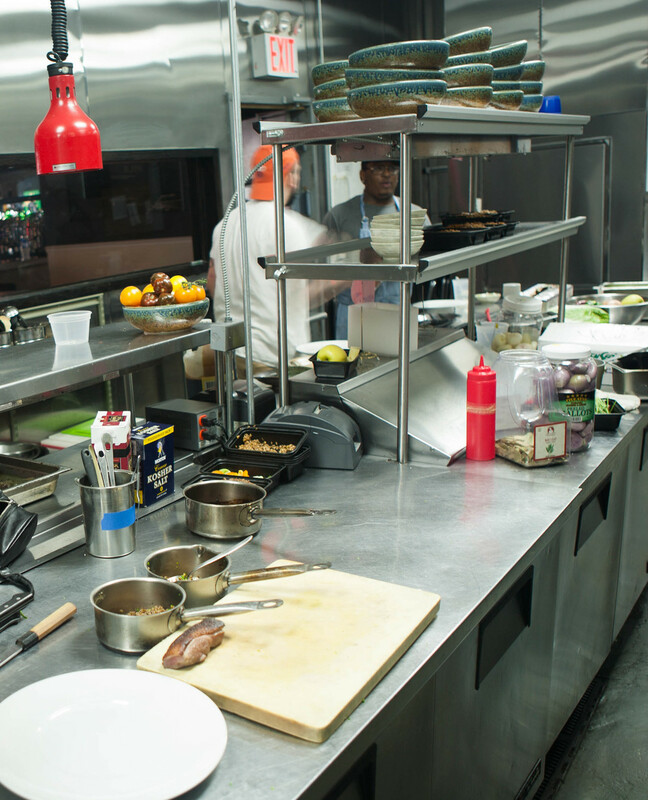 Aside from his Trinidadian roots and hip hop style influences, Akins is what we describe as an experiential chef. He prides himself as an outside the box thinker and in his own words describes his approach to styling as "going around the plate. I'm very big on plates. The [culinary] world is like fashion, every year its something different" in reference to the changing visuals of food styling. "Now textures and handmade clay plates are being used as backdrops for food" allowing him to be even more creative when presenting his dishes. He is also influenced by how others are styling the plate, as we observed him taking inspiration from online sources to influence his own presentation that day. More interestingly, Akins is a collaborative force in the kitchen,putting his trust in the team around him to allow for magic to happen. "You have to...when I cook for people they put their trust in me so...its the same thing". We believe this organic process is what allows for maximum creativity and growth and the reward is ultimately passed on to the patron, encouraging otherwise conservative eating habits to evolve into greater exploration and varied experiences. Overall, Akins aims to be memorable. He feels certain chefs paint themselves into the proverbial box by doing the same things repeatedly [well, mind you] and not allowing themselves to evolve and grow. To that end, Akins is an avid reader, mainly of old cook books. "Books are like power and they are disappearing". His current favourite cook book is Fat Duck by British chef Heston Blumenthal. Part of his development and thus inspiration is from constant education and exploration...reading about others' cultures and food processes. Japan is on his culinary immersion plan, as their level of order, discipline and consistency in the kitchen holds great appeal. We truly enjoyed getting to know this introverted personality and even more so spending time with him in the kitchen. Read on to hear his own words about how he got here and see his mastery at work through our eyes. Uniondale, New York, US. I finished my last two years of high school out here [Brooklyn]. 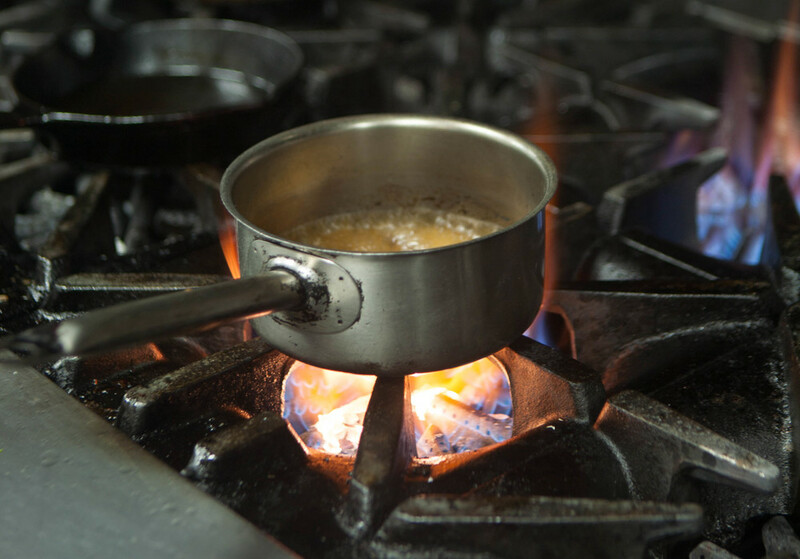 When did you choose to become a chef and why? When I was about 12, my father was always at work and I remember watching the food network. I would try out the receipes I had just seen on TV and my father loved my food. Thats when I knew I was destined to be a chef. No, I knew this is what I wanted to do for the rest of my life. My first restaurant job was at Sip City in Great Neck, NY. Did you always know that you could cook well enough that persons other than your family members would eat it? Marco Pierre. I remember watching clips of his show, his food is timeless... soigne even. His cooks gravitate to him and its clear why, he is an awesome teacher. Really good chefs tend to be very creative individuals, artists. Where do you get your ideas for food plating and our food composition? Has your cultural background influenced your food? Definitely, my culture plays a major role in the flavor profile of my dishes and techniques. Growing up on a caribbean island (Trinidad), there is such a wide array of robust ingredients. Seafood is fresh and most of your produce grows right in your backyard. If you look at my dishes, I always pay homage to my background in my use of traditional techniques and by featuring staple dishes from my country. If you could go anywhere in the world to learn their food techniques, where would you go and why? What or who inspires your food and why? I would say the seasons inspire my food. I would compare food to fashion. It changes often and so does my menu. My food is also inspired by the talented chefs I follow and by the many books I read. I would have to say my favorite season for cooking is winter because its the perfect season for comfort food. Heavy dishes like stews and soups. How does your kitchen dynamic change when a food critic, food influencer shows up at your restaurant? It doesn't at all, all of our patrons are critics. Maybe they aren't going to write an article or feature us on a blog, but our ability to please determines whether or not they return or tell they're friends and family about us. What is the most unconventional material you've used in your food? It was actually a machine called a centrifuge. Its usually used in the medical field to seperate blood. Ive used it to separate different ingredients such as milk, carrot, butter etc. To separate liquids from solids or fluids of different densities. Any recent accolades or write ups you would care to mention? We recently received a bib gourmand from Michelin for the second year in a row. I was also featured in a write up about chefs and their sneakers on SLAMOnline. Why? It was the most memorable food, the attention to detail was exceptional, the food was clean and was perfectly represented. 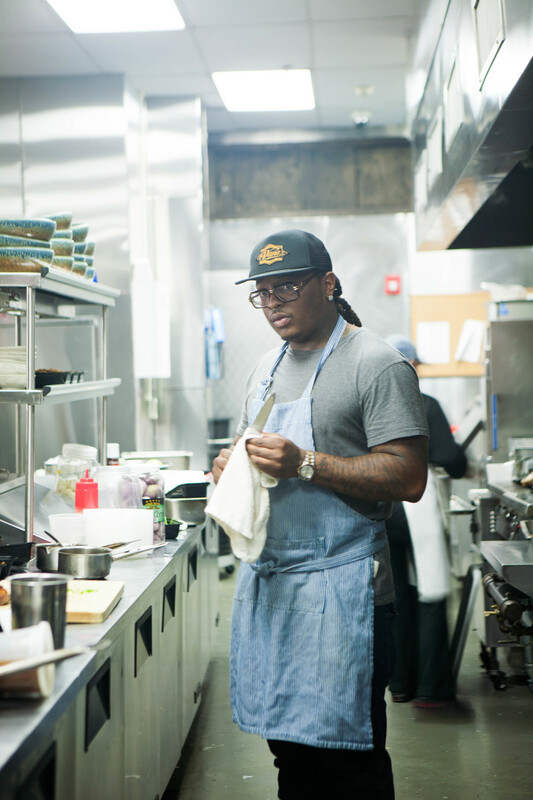 We wish Chef Akins nothing but greater success and achievement. His long-term goal is to have his own open-plan restaurant, where diners will have direct contact with the chefs at all times to get a fully immersed culinary experience and interaction. You can find Chef Akins at Milk River restaurant and online with his most adorable son on Instagram. Please comment below and share your thoughts on our Chef. AND sign up for our monthly Hospitality + Art + Design newsletter HERE if you aren't already on our list.